This charming table lamp design features a detailed base and a unique shade which combines over 100 pieces of Tiffany-style glass with natural mica panels. A cross-hatched wicker-look decorates the base of this charming table lamp design from our best-selling Tiffany-style lamps assortment. The piece features a French bronze finish on the base. The Mission design shade combines mica with Tiffany style glass. Twin light pulls complete the classic look. This shade is fashioned with the naturally occurring mica mineral. Slight variations due to the natural tone and pattern of the mineral make each shade unique. Overall: 28 1/2" high. Shade is 4 1/2" wide at the top x 18" across the bottom x 9" high. Weighs 14 lbs. Takes two 60 watt bulbs (not included). Twin on-off light pulls. Hand-made shade features over 100 pieces of Tiffany-style stained glass and natural mica. Two mica panels on each side. The mica elements are unique and different, slight variations in color tone may occur.. Bronze finish base. Cast resin construction. I wanted a lamp that provided a strong presence in the room and added some color and vintage charm. It appears to be classy and it fits our 1909 Craftsman style home. I live in a Craftsman Style home and these lamps will go with the styling of my house. What is the difference between a Tiffany and a Dale Tiffany? BEST ANSWER: Hi - Dale Tiffany is one manufacturer out of many designing and making tiffany style lamps. The word "tiffany" can have more of a general type of meaning which can include a lamp or shade designed/constructed of colored glass. BEST ANSWER: Hi - this design weighs 14 lbs. This lamp weighs about 14 pounds. is it available as a ceiling light? BEST ANSWER: Below is a link to some of the Tiffany style glass ceiling lights that we offer. I bought this lamp because I thought it would fit in the new log home we are building this summer. I am decorating it in the mission style. The picture does not do it justice it is beautiful. I like the way the color of the shade gives the room a warm glow. I am very pleased with this lamp. Used in a reception area of the office, it provides just the right ambient light, while adding maximum style to the decor. Compact flourescents DO NO fit well without substantial modifications. For "traditional" bulbs, it's a perfect Mission/Craftsman piece. Very pretty when lit. This lamp is absolutely beautiful !! This lamp just sets the romantic relaxed mood in my living room that I was looking for. I absolutely love it! The color and quality is outstanding. I have small bulbs in it at the moment, however, if needed, larger bulbs would provide light and a perfect lamp to curl up and read by!! YOU will love it !! Lighting is limited to the reading area as it is on the floor lamp as well. I love the finish and mission style look.I am a fan of tiffany lamps. Overall I like the product and it looks great in the room and the price is just right. .
the one I got had bad threads on the nut the holds the light stem. I did not wish to ship the whole thing back so fixed it myself but you might look into closer inspection befor shipping. We are thrilled with these beautiful lamps. They are of excellent quality and look wonderful. 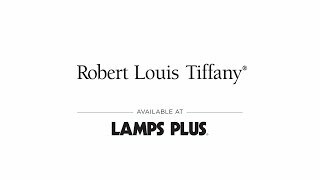 We were very impressed by the service we received at Lamps Plus and highly recommend them for the quality, selection and policies. Fabulous Lamp- Great Customer service! Awesome lamp at a great price! I am going to order the tall lamp that matches because they are so gorgeous. Just fits perfectly in our family room. The choice of one or two bulbs on at a time make it perfect for casual lighting or better lit for reading.The bulbs are easily controlled with the easy pull of a metal cord. Love it - love it - love it!!!! A great choice for my newly decorated living room. Great quality. Easy to assemble. No complaints what-so-ever. It's besutiful in my family room. Delivery was fast and sales staff were very knowledgeable and helpful. Beautiful lamps, just what I wanted! We purchased 2 lamps for our sofa tables. They are perfect. By having 2 bulbs in each lamp, we are able to have just the right amount of light. Great light to create a soft, warm lighting, yet it is a great light to read by. This lamp is fairly heavy. The base is solid. Much more substantial that I expected. The sightline of the bulbs are low so may want to use a lower table. I turn this lamp on just to show off the room, it looks so nice. Great ambiance. Excellent quality, it exceeded expectations. When the lamps were delivered they were prompt. The lamps were extremely tightly package well. As for customer service they were professional well spoken and very helpful. Very prompt delivery and packaged well. Delivery was prompt. Lamp was in excellent condition. I bought this lamp for my living room, it works well with my decor. It gives off a soft romantic glow in the room. The design is also really nice. I really can't say anything bad about this lamp. I would definitely recomment this to my friends. great price to. It adds to our living room. it pulled the look all together. Looks great in the living room. The table lamp and matching floor lamp completed our family room. When I am sitting across the room, with my husband using lamp sometimes the bulb blinds me because the shade does not cover the bulb. Ordered two of these at the same time. I don't know why, but they were shipped seperately and arrived several days apart. Customer service was great, continued to track the items until delivered and made sure we were satisfied. We also called with a lightbulb question and they were super helpful. Thanks! Great looking lamp my only complaint about it is the shade does go down far enough and the light bulbs are visible when sitting.